A holiday dinner is not complete without dessert. Even if I am stuffed to the brim, and my yoga pants are hugging tightly around the waist, I will still find room for a generous serving of dessert. No morsel of food goes to waste when I’m around! When it comes to Thanksgiving desserts, which is your favorite? Personally, I’m all about the pumpkin pie, and it’s definitely going on my menu this year. Mama Lin, on the other hand, is not a fan. She’s the only person in my family who can’t handle intense cinnamon flavor, and she doesn’t quite enjoy it in a pumpkin pie. 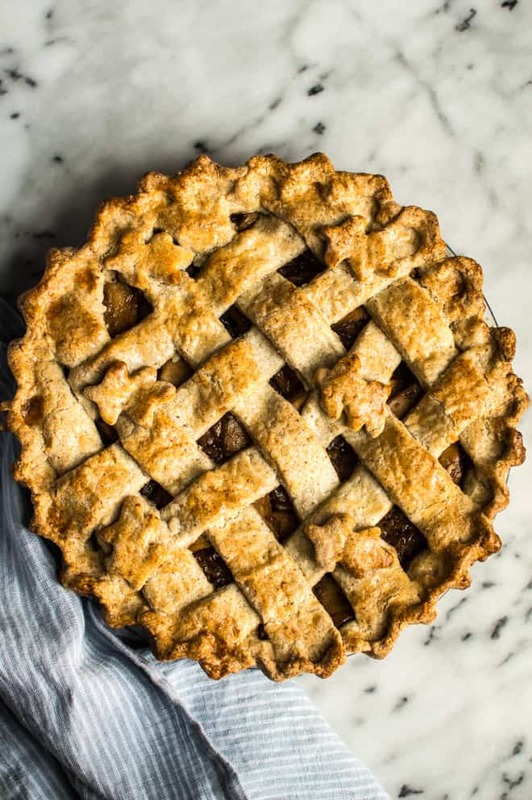 Enter this gluten-free apple pie. It will require some effort to make, but the final product tastes amazing, especially when with a scoop of ice cream. Mama Lin needs to watch her sugar intake a bit, so I lowered the amount of sugar and used coconut sugar to sweeten this pie. There is cinnamon in it, but I think it enhances the flavors of the apples and doesn’t stand out on its own. Feel free to adjust the spices to your taste! Gluten-Free Pie Crust Recipe: I used this recipe from The Bojon Gourmet. 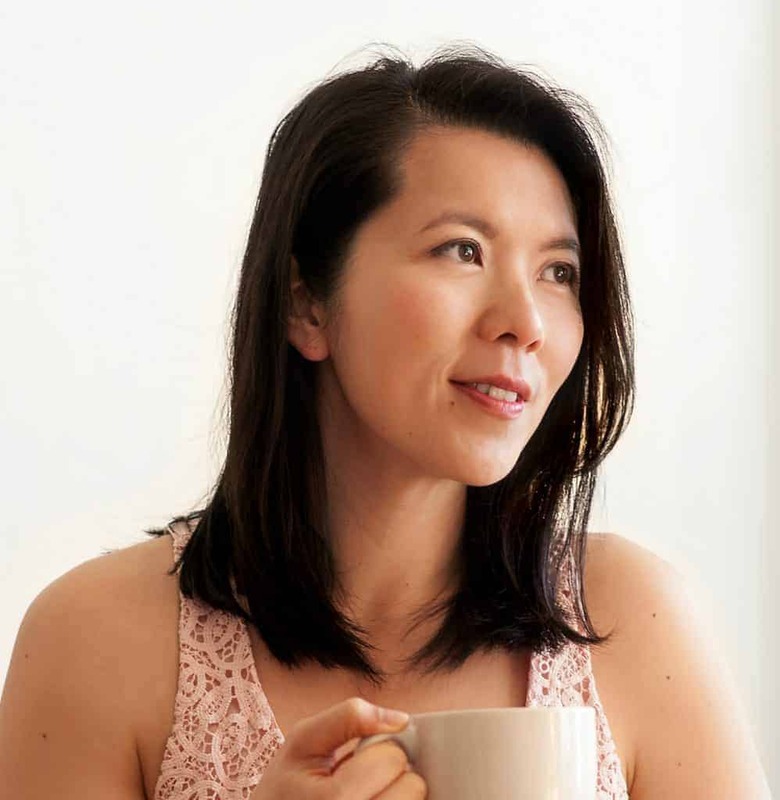 Alanna has a lot of helpful tips and great step-by-step photos on how to make the crust, so be sure to read her post if you feel lost at any point. I skipped the step where she rolls out and folds the crust, and the crust still tasted great. Rolling Out the Dough: This is probably the trickiest part to pie making. You could roll it out over a lightly-floured surface and rotating and flipping it to keep it from getting sticky. I still struggle with this method sometimes. A trick I learned from America’s Test Kitchen is to roll the dough between two sheets of plastic wrap. It’s the easiest way to deal with pie dough, especially if it’s a bit sticky. Blind Baking the Crust: Sometimes, pie recipes call for baking the crust for a while before filling it (usually pies with a runny or custard filling). The first time I made this apple pie, I blind baked the crust. The finished pie had a crispier bottom crust, which I liked. However, blind baking is not necessary for the recipe. Lattice Top: If you’re making the lattice top for the first time, you may struggle a little, as I did. Here are a few troubleshooting tips. First, make sure that your cooked apples are completely cool before you do the lattice work. Those crust strips will crumble easier if you place it over warm apples. Second, try to make sure that your strips are at least an inch thick. If you want to be on the safe side, go ahead and create the lattice with 6 to 7 thick strips. And if all else fails, cover your mistakes with leaf-shaped cutouts of the dough, as I did. No one will notice! If you try this recipe, be sure to share your creations with me! Tag me on Instagram or Twitter so that I can give you a fist bump! 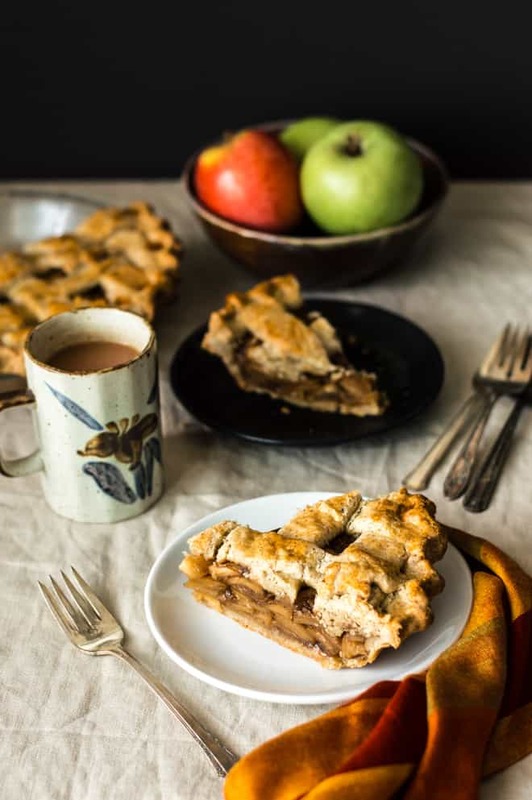 Gather up your favorite apples for this delicious pie! This pie uses coconut sugar, which yields a pie that is not too sweet. Cook Apples: Melt butter in a large sauté pan over medium heat. Add sliced apples and stir to coat with butter. Reduce heat and add the sugar, spices, and salt. Stir to coat apples with sugar. Cook for 5 minutes, until the apples start to soften. Sprinkle in cornstarch and cook for another 2 to 3 minutes, stirring occasionally. Turn off heat and spread apples on a baking sheet to cool. Prepare the Bottom Crust: Roll out of your pie crusts until you get a 12-inch round. You can roll the dough out on a lightly floured surface or between 2 sheets of plastic wrap. I think rolling it out between plastic wrap is the easier, less messy way to do it. Transfer the pie crust to a 9-inch pie dish. To transfer the crust, drape the dough over your rolling pin, fold the crust in half (twice), or simply transfer the crust with the plastic wrap. Fit the crust tightly onto the pie dish to get rid of any air pockets that may have formed. Trim excess dough to get a 1″ overhang. Cover crust with plastic wrap and freeze it while you prepare the second pie crust. Prepare Top Crust: Roll out the second pie crust until you get a 10-inch round. Cut the pie crust into 10 1-inch strips. Finish the Pie: Take the pie dish out from the freezer and fill it with cooled apples. Lay 4 strips of crust on top of the pie dish. Flip back the first and third strips and lay another strip perpendicular to these strips. Straighten out the flipped pie strips. Flip back the second and fourth strips and lay another strip perpendicular. Continue until you have covered the entire surface with latticed strips. Trim dough to get a 1/2-inch overhang. Fold and tuck crust right above the lip of the pie plate. Flute crust by creating indentations with your thumb on one hand and your thumb and index finger on the other. Gather extra dough and roll out to make small leaf cutouts. You can use these leaf cutouts to decorate the pie (or to cover blemishes, as I did). Beat egg and milk together to create egg wash. Brush egg wash over pie crust and bake pie for 45 minutes, or until the crust is a nice golden brown. Serving: Let pie cool for 1 to 2 hours before cutting into it. Serve with ice cream, if you like. Store leftovers in room temperature in an airtight container for up to 2 days. Refrigerate leftovers if you are storing them for a longer period. Reheat pie in a 350 degrees F oven (175 degrees C) for 10 minutes. 1. You’ll probably have some leftover dough left. Cut them out into different shapes and bake them into butter cookies! The cookies should be ready in 12 to 16 minutes with the oven on 375 degrees F.[br][br]2. Add the leftover egg to your next egg scramble! 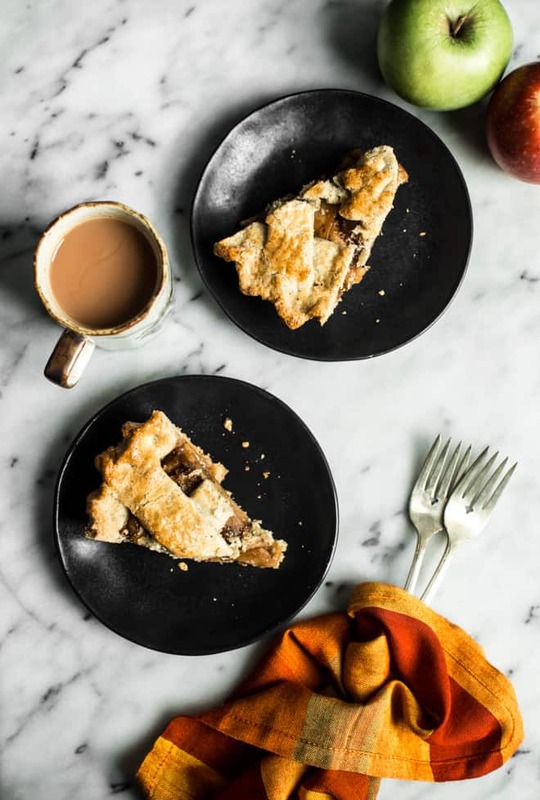 Looks absolutely delicious Lisa 😀 It’s so cold where I am right now, wish I could have a slice of this apple pie to keep me warm! Thank you so much, Nadia! Wishing I could send you a slice of this to warm you up! 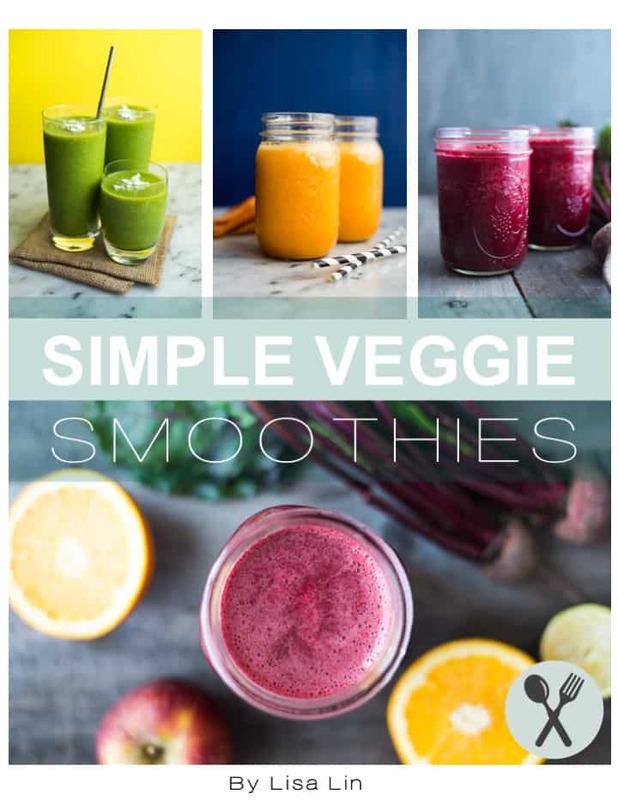 My oldest son and his girlfriend are vegan and I struggle to find yummy, easy recipes that I think his four brothers might actually take a bite of, as well! These all seem like I could vegan them up pretty easily and be able to talk the rest of the crew into eating them, too! Thanks for leaving me a comment, Stephanie! Yes, you should be able to substitute the butter I used in the crust for vegan butter. Hope you enjoy it! Thank you SO, SO MUCH, Alanna!! Maybe, one day, my photos will be half as good as yours! And that crust was so awesome. Thank you for sharing it! This pie looks great! Gluten free pie crust can be tricky – and you’re right, plastic wrap is the best for rolling. I like the way you think, Traci! I hope you had a wonderful Thanksgiving, too, Traci! Mama Lin was definitely proud of the dinner and how I’ve kept the house (relatively) tidy! Lisa this apple pie is gorgeous! It’s so loaded with apples and cinnamon, just the way I like my pie! You have to tell me your secret for getting that perfect scoop of vanilla ice cream, mine never look that pretty! Thank you so much, Danae! I got a bit luck with the ice cream! I will say, though, that the mechanical scoops (the ones with the spring) make it easier to form the perfect scoop. Whoa!!! That scoop of ice cream is WHOPPING!!! Gorgeous photos friend! 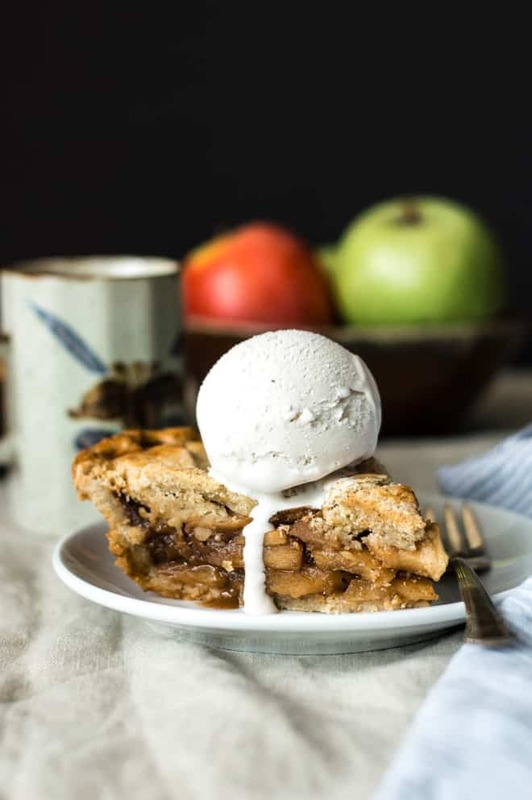 A big scoop of ice cream is totally necessary when eating apple pie, right? Thanks, Beth!! I’m intrigued by the use of coconut sugar – I bet it works in such beautiful harmony with the mellow sweetness of apples. YUM! Thank you so much, Jessie! It was definitely less sweet than some of the other apple pie’s I’ve eaten, but I love it! Thank you so much, Liz! Yes, homemade pies definitely require a bit of extra effort, but I’m always happy with the results! Gorgeous photos! I love that big old scoop of ice cream on top. That’s my way to eat pie!!! Thank you so much, Brielle! 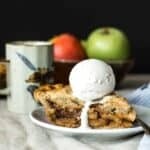 Gotta have apple pie with ice cream!